Before first experimenting with gliders, the Wright Brothers built and flew this kite in Ohio in 1899 - it was in fact their first flying machine. 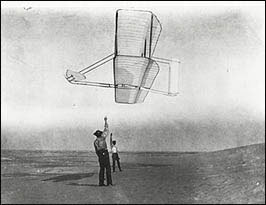 It was with this kite that the Wrights worked out their novel idea for wing warping - that is twisting the wings to turn the machine. It was the success of this kite that inspired the Wright Brothers to fully enter the field of human flight.